Introducing the all-new Banks Brake. TOP OF THE HILL… NOW WHAT? You’ve crested that big hill and need to start thinking about slowing down. What do you do? Ride your service brakes and hope they don’t overheat? Downshift the transmission and possibly over-rev your engine? Look for a runaway truck ramp?? When you’ve got a heavy load behind your truck and steep downhill grades to deal with, instead of feeling in control you can sometimes feel helpless. Not anymore. The new, all-electronic Banks Brake offers total safety and a whole lot more. HOW DOES THE BANKS BRAKE WORK? It works by modulating systems already found on the vehicle… no mechanical additions whatsoever. And its level of braking power and intensity is completely user-selectable at the turn of a switch. It’s extremely easy to install, even easier to use, and best of all, we’re offering Banks Brake at a value price previously unheard of! Only Banks Brake intercepts communications to the ECU and changes them to optimize the braking performance that you command. Only Banks Brake intelligently locks and unlocks the vehicle’s torque converter or coast clutch to ensure that proper engine braking force is sent to the wheels. Only Banks Brake controls gear selection in order to choose the best gear for any given braking situation w/o building excessive engine RPM. Only Banks Brake captures control of your turbo, varying vane position to provide optimal engine backpressure, controlling preset downhill speed. Towing a heavy load and dealing with steep downhill grades can be a scary proposition. Under those conditions, things can happen in a big hurry. At Banks, we believe that there’s no such thing as having too much braking power. If you’ve been in a situation where you’ve needed to pull up on the reins on your truck and trailer quickly, we think you’ll agree. Safety is and ought to be the number one concern when you’re behind the wheel of your truck. At minimum, you want to protect your valuable property. But what we’re really talking about is protecting your very life, the lives of your passengers, and even the lives of those in the vehicles around you potentially. When you need to slow down or stop in a hurry, do you have the real-time braking power and control necessary for true peace-of-mind? Well, Banks engineers have designed a most elegant — and affordable — solution. Our Banks Brake delivers exactly what you need… firm control over your truck and trailer’s downhill momentum and the ability to pull up quickly if the need arises. With its easy-to-use switch control, you set the braking intensity and Banks Brake does all the rest. Your desired downhill pace is achieved and your service brakes stay cool and at the ready should conditions call for their supplemental use. Most important of all, you can rest assured and enjoy the hilly country rather than fear it. Banks Brake is truly in a league of its own. By delivering enough stopping power to bring your truck to an absolute crawl — intelligently and automatically — only Banks puts safety and peace-of-mind back on your side. The next time you crest a big hill with your truck and trailer, make sure you’ve got the Banks Brake riding shotgun. Upgrade the switch to the Banks iQ and you now have a SpeedBrake. This gives you all the same great features as the Banks Brake with the additional of Downhill Speed Control. Not to mention all the cool features included in the Banks iQ! 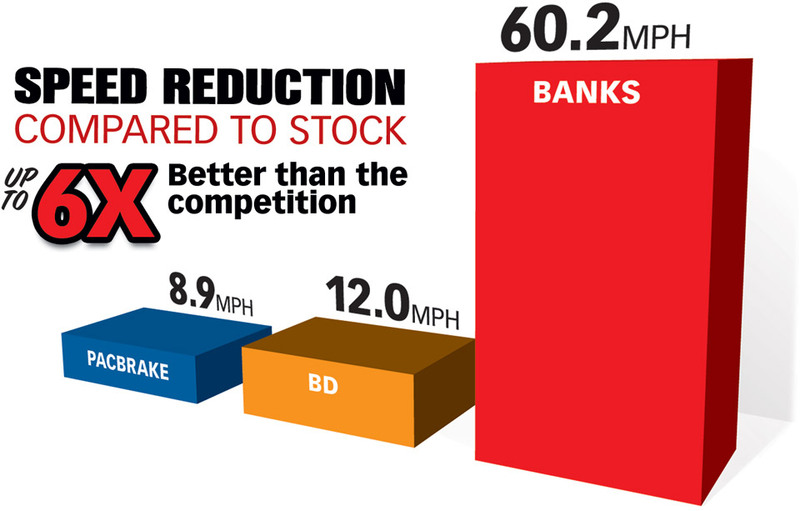 Banks SpeedBrake is a revolutionary, patented all-electronic braking system with downhill speed regulating capability, user-adjustable set point speeds (25-75 mph) and built-in safety features. It takes exhaust braking to a whole new level by combining intelligent manipulation of the turbo’s variable geometry turbine vanes with specific control of gear selection and torque converter clutch application when engine braking is commanded. SpeedBrake has numerous operating modes and settings to optimize braking function for individual preferences and conditions. Why Install An Exhaust Brake? Because safety is job one. Cresting a large hill towing a heavy trailer demands all the control you can get your hands on. Our competitors’ brakes utilize technology that was cutting edge in the 1960’s but wholly out-of-date for today’s modern diesels. Finally, there’s a braking product advanced and effective enough to give you total confidence, no matter the steepness of the grade or the size of the load. It’s called the Banks SpeedBrake and it’s going to forever change the face of exhaust braking. Imagine the ability to dial-in your desired downhill speed, drop the throttle, and sit back while your truck automatically responds to your command. SpeedBrake cuts downhill speed by up to 80% without you having to touch the foot pedal. That keeps service brakes cool, vastly extends their life, and keeps them ready in reserve in case of emergency. 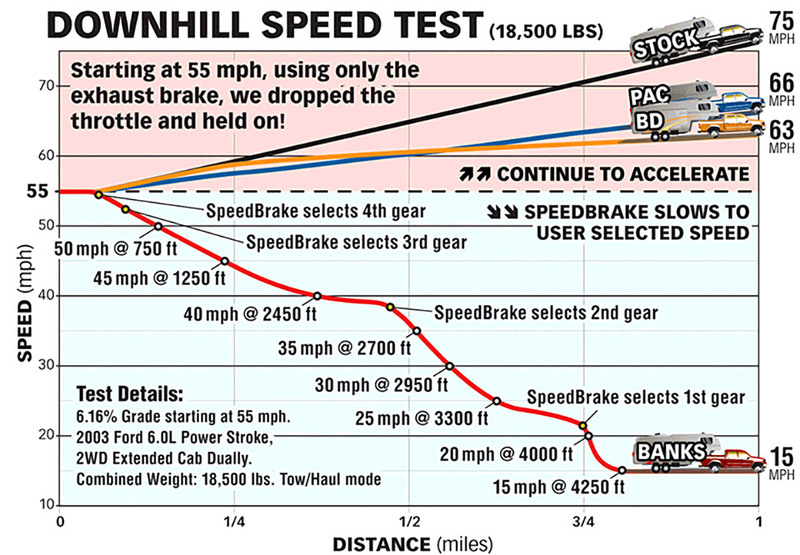 It’s like having a downhill cruise control… set the speed you want and SpeedBrake does all the rest. No other brake on the market today gives you that kind of control and peace-of-mind. SpeedBrake has operating modes and settings to suit your style and driving conditions. ON mode lets you select three levels of braking aggressiveness: HIGH, MED, LOW. Use SPEED CONTROL MODE to select and automatically maintain a specified downhill speed (25 - 75 mph). In addition, the user can enable or disable FOOT BRAKE ACTIVATION, depending on individual preferences and vehicle load. Banks iQ provides 2-way communication, has a system status indicator with on-screen alerts, and OBDII scan tool capability. In addition, it displays numerous vehicle parameters, from current braking effort and operating gear to braking mode and target speed. Amazing! So why settle for primitive exhaust brakes that barely brake? If your diesel hauls and navigates hills, step up to the world’s strongest, most advanced exhaust brake: the all-electronic Banks SpeedBrake! We put our SpeedBrake up against stock’s "tow-haul" mode, a PACbrake equipped truck as well as a BD brake equipped truck. Starting out at 55 MPH, using only the exhaust brake, we dropped the throttle and the results were shocking. At the end of the 1 mile test, the stock truck continued to accelerate to 75 MPH! The PAC and BD equipped trucks didn’t fare much better, actually accelerating to 65 and 63 MPH respectively. Aren’t these products supposed to slow you down? Only the Banks SpeedBrake did the job, slowing the truck to a 15 MPH crawl at the end of the 1 mile run. I wanted to let you know how the Banks SpeedBrake may have saved my family’s lives…I pull a 2007 Cedar Creek DayDreamer 34 RETS which loaded is close to 15,000 lbs. In June, we took our first trip outside the flat lands of the Midwest to Virginia…The longest descent was a 3 mile 6% grade in West Virginia and I never touched the brake pedal once. I just set the SpeedBrake to 50 mph and it held that speed all the way down… Later, when I hooked up and tested the trailer brakes I noticed I didn’t have any! The Banks SpeedBrake did exactly what it was designed to do, and without it, I am not so sure this trip would have ended with our safe return home. I can honestly say I am very satisfied with my purchase. Diesel engines control engine speed and power output by throttling the amount of fuel injected into the engine. A diesel has no air throttle. Because it has no air throttle, a diesel engine offers virtually no engine braking when the driver lifts off the accelerator pedal. There just isn’t a pumping loss to retard engine speed as the piston descends on the intake stroke. Air is free to enter the cylinder, restricted only by the flow capacity of the air cleaner, turbocharger compressor, intercooler, intake manifold, cylinder head port and intake valve opening. This can be disconcerting to a driver that is used to the engine braking produced by a gasoline engine, and it can be downright unnerving to the driver of a heavily-loaded diesel pickup or motorhome on a downhill grade, especially if the vehicle’s service brakes begin to overheat and fade. That’s why exhaust brakes, such as the Banks Brake, have become so popular for such diesel vehicles. Before we go any further, we should mention that an exhaust brake is not a noisy compression brake, or "Jake" brake such as used on diesel big rigs and dump trucks. A Jake brake works by using hydraulic pressure to momentarily open the exhaust valve at the end of the compression stroke, venting off the compressed air into the exhaust system. That’s where all the noise comes from. The braking of a Jake brake occurs because of the pumping loss compressing the air, and then eliminating the compressed air “rebound” on the power stroke. Additionally, there’s a pumping loss as the piston descends on the power stroke with both valves closed and no combustion. An exhaust brake is a device that essentially creates a… read more!